A String in the Harp by Nancy Bond. With this one, I speak from experience. I tried for weeks to stir up a bit of interest in this title at my school library. I began with the simple act of placing it cover out on the shelf. There it sat. Then I stepped things up by moving it to the Recommended table at the entrance. No luck. I’ll keep trying. Am I imagining things here? I’ve only lately discovered your blog so this is your first Unfortunate Cover I’ve seen and have just taken the tour of the other hilarious 12. Very, very funny and makes one wonder what the publishing industry is sometimes thinking (especially re. the newer editions, of course). It lends credence to Ed Spicer’s comment – in your recent interview – that our culture doesn’t value illustration as highly as words. Thank you for posting! Well, thanks for reading. 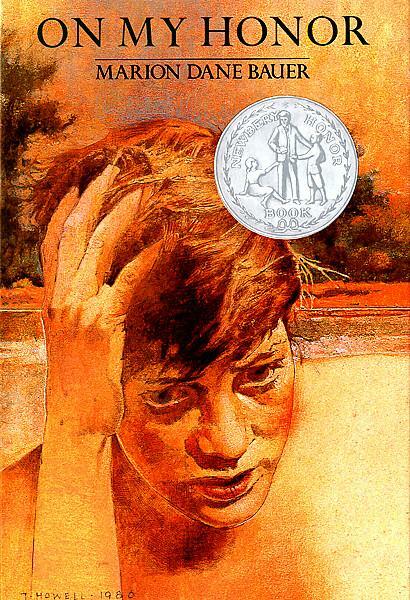 I think this cover suffers that Newbery time warp syndrome where the hardcover isn’t changed after it wins the award. At least, I’m assuming this is the original. I like that you can still get this cover, but an updated hardcover option would also be nice to see. There is a more updated paperback available. I KNOW! I love, love, love A String in the Harp. It was one of my favorite books when I was in, like, 6th grade. And I can’t get a kid to pick it up to save my life. A frustrating predicament. I felt the exact same way about #4 on this list Danny, the Champion of the World. I really want kids to get into it as much as I did, but the cover … well, it was not helping. What, does the artist only know how to draw one boy? And one boy who kills books too. Suddenly photo covers don’t seem so bad. Oh man, no way would I pick that up as a kid. I’ve never read this one or even heard of it, either! There’s not an afternoon I spend at my volunteer position in a children’s library that I don’t hear several comments about choosing books for their covers…maybe unfortunate, but true. Sigh. Ain’t it the truth? I remember reading many of those books with those covers. I always enjoy the memories when you add them. By the way, your blog is one I always manage to read first, even when I get behind on my blog reading. Thanks – that’s nice of you to say! This is the first time I have visited your blog and find it extremely interesting. I am not familiar with the book but how about taking an unusual artifact or item from the book and placing it next to the book on display to get kids talking about it. Harps are generally very expensive so perhaps an art class could create a large cardboard one for you and paint it. Kids love something eye-catching, and especially something out of the ordinary. Hope this helps! Dang, that would work to stir up some interest!